On April 2, 2011, LCD Soundsystem played their last show to a sold out Madison Square Garden in New York City. They played 29 songs over a nearly 4-hour span, including all of the hits like “All My Friends” and “Daft Punk is Playing at My House”. The crowd cheered for one of the biggest bands in indie history and cried as one of the most influential chapters in dance/punk came to an end. Balloons flew, lights strobed, and the show came to an end. An era ended. On July 18, 2012, LCD Soundsystem orchestrated a one-night nationwide viewing party of Shut Up and Play the Hits, which was shown at Cinerama in Belltown for the Seattle viewing audience. Hipsters from all over came to see the documentary, which follows LCD frontman James Murphy through his Page One of the next chapter. His “what happens when the story ends?” This documentary is a look into the mind of Murphy as the last show came, happened, and went. 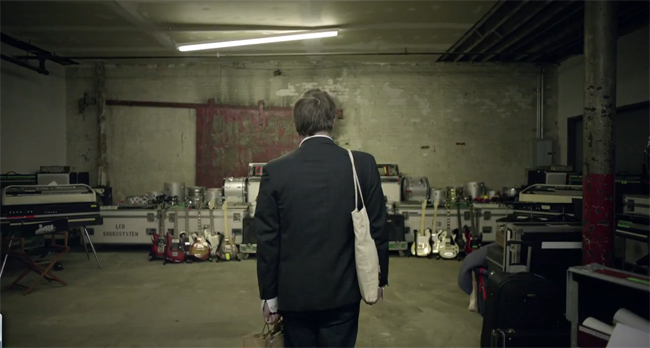 While the film may not resonate to legendary status the way that LCD Soundsystem have as a band, it certainly provides exactly what one would expect; a look into the closing of the most influential chapter of a man’s life. At the documentary’s heart, it provides a very humanizing look at the bigger-than-ourselves project that has been LCD Soundsystem. We are with Murphy as he recounts the band in the scheme of his own life and the life of music during an interview with Chuck Klosterman. He keeps things in perspective despite the obvious superstardom that the concert footage recounts. Much like anyone in a transition, Murphy laughs, cries, and doesn’t know exactly what comes next. In the end, Murphy is human just like you and me; something that can get lost in the flashing lights and hazy recollections of concerts past. So many music documentaries give you the “before” and the “during”, but not enough of the “after”. When the story ends, what comes next? Experiencing the day after the last LCD Soundsystem show is one that has been unique to film. Maybe this is with good reason because the next day is not all that interesting as Murphy sleeps in, walks his dog, shaves, and recounts the previous night with a friend like many of us have done. To me, though, it was interesting to bring LCD Soundsystem down to “average Joe” status. For this reason, I will forever appreciate Shut Up and Play the Hits. I walked away from this film thinking that I, too, could be a part of something bigger than myself because Murphy did so as a regular person just like you and me. His fame came through his 30s. He partied nights away and woke up with hairs grayer than when he started. He created music that he wanted to create and, coincidentally, people wanted to listen to. The difference is that Murphy took what was extraordinary about himself and made it into something big. Watching this film made me feel like life will continue and the opportunity to be extraordinary will always be available. We just have to determine what extraordinary is the way that LCD Soundsystem did.